Paul Mooney, head of IT at the Law Society of Ireland, laments about his need to solve BYOD/Wi-Fi problems - what he did and why. Educating "At Risk" Youth Please Visit: http://Fighting4Youth.com for practical and powerful strategies on being more effective with "At Risk Youth". Engaging Students | How to Keep Students Engaged! Getting Them all engaged - She is an amazing Master teacher and if you ever get a chance you need to make sure to see her speak. This is a fun way to help students learn how to spell. Also there are many professionals as Anita Archer that talk about the importance of Vocabulary as a best management practice for master educators. Are you looking for one of the weekly release of 22.i newsletters? here is a link to all of them. 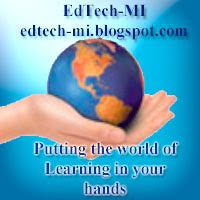 Help get the word out about Edtech-mi blogsite. If you like this blog site your help is needed. I would like to ask you to post the link to this blog site to your professional organization or Social pages to help me get the word out about Edtech-mi blogsite. If you don't think you can fit anything more into your teaching and time then you need to read this. If you don't think you can fit any thing more into your teaching and time then you need to read this. When things in your life seem almost too much to handle, when 24 hours in a day is not enough, remember the mayonnaise jar and two cups of coffee. When the class began, wordlessly, he picked up a very large and empty mayonnaise jar and fills it with golf balls. The professor then picked up a box of pebbles and poured it into the jar. He shook the jar lightly. The pebbles rolled into the open areas between the golf balls. The professor next picked up a box of sand and poured it into the jar. Of course, the sand filled up everything else. He asked once more if the jar was full. The students responded with a unanimous “YES”. children, health, friends, and favorite passions. Things, that if everything else was lost and only they remained, your life would still be full. The pebbles are the things that matter like your job, house, and car. The sand is everything else -- the small stuff.” he said. important to you...” he told them. Please share this with other "Golf Balls"
Kick off the new school year with a no dues MACUL membership. Join a SIG, access MACUL Journal, and get connected with over 11,000 members worldwide. While you're at it, find a friend to join too! Secretary Arne Duncan Quote ~ Too many here in Washington believe education is an expense that can be cut in tough economic times. I believe education is an investment. How to do a ping or trace on a chromebook using crosh. Press Ctrl-Alt-T this will open a chromebook shell. Send ICMP ECHO_REQUEST packets to a network host. If is "gw"
then the next hop gateway for the default route is used. Starts the ssh subsystem if invoked without any arguments. or "ssh @ " connect without entering the subsystem. Here is a command to find more help. Display the help for more advanced commands, mainly used for debugging. a menu of known hosts and prompts for the host to forget. Core specification for valid options. Sets the chapsd logging level. No arguments will start verbose logging. Enable or disable experimental storage features. Add and remove flimflam debugging tags. Performs extensive memory testing on the available free memory. Interact with the 3G modem. Run "modem help" for detailed help. Configures the modem for the specified carrier. of the output to your download directory. Set the APN to use when connecting to the network specified by . Clear the APN to be used, so that the default APN will be used instead. and enable beam forming on Pixel. "sound beamforming " will enable/disable the feature. "sound record [duration]" will start recording. "sound play " will play the recorded audio samples. Reads storage device SMART health status, vendor attributes, and error log. Performs a short offline SMART test. Performs an extensive readability test. Logs a message to syslog. Manually adjust advanced touchpad settings. Trace the path/route to a network host. Tweak the mouse acceleration rate. autorepeat starts. The rate is the number of repeats per second. key. If not specified, it affects global behavior. This link will take you to a site that will show you how to distribute and collect students work over the internet using google Drive and apps. This looks like a great way to collect all your assignments and keep from them organized. Insight empowers instructors with the ability to educate, assist, monitor, and communicate with an entire computer lab from one central computer. Instructors no longer need to deal with classroom distractions like games, instant messaging, and web surfing when in a a computer lab.